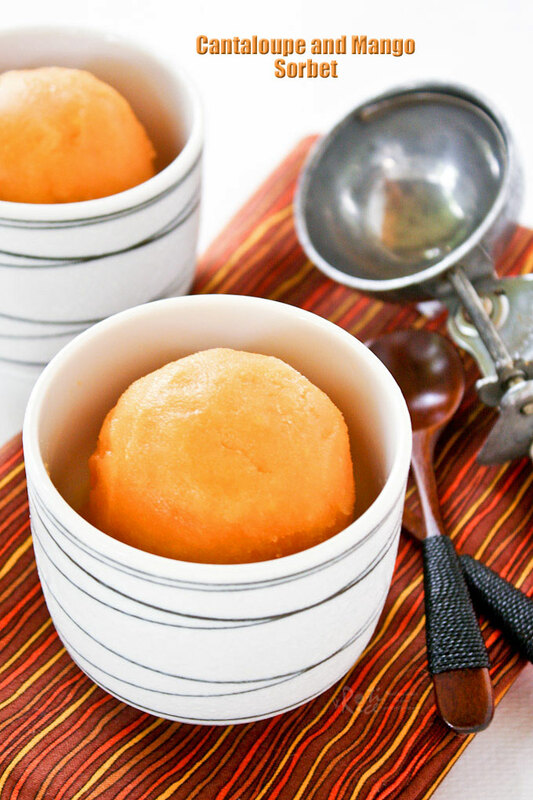 Only four ingredients to make this juicy and refreshing Cantaloupe and Mango Sorbet. A wonderful combination and a must try for the warm summer months. One of the best things about having your own ice cream maker is that you can create a myriad of flavors not available at the stores, like this Cantaloupe and Mango Sorbet. The possibilities are endless with the abundance of fruits at this time of the year. Other popular flavors include chocolate, peanut butter, and liqueur for the adults. You can also make it as light and healthy or as rich and creamy as your heart desires. With the warmer weather upon us, it is time to bring out your the ice cream maker and start putting it to work. If you are thinking of getting one, now is the time to do it. For a long time I was hesitant. Finally, Ro-Ri San brought one home for me two years back and we have been enjoying some really cool flavors. Do check them out. Just click on the picture to get to the post. Recently, the boys developed a liking for cantaloupe and so I try to pick up a melon or two whenever I am grocery shopping. A ripe melon is a sweet melon but it is not always easy to find one. I like to keep the melon on the counter for a couple of days so that it has a chance to fully ripen. It is definitely worth the wait! My favorite fruit is the mango. We only have two to three types of mangoes here but it is good enough for me. The longish ones from the Asian market are especially sweet and delicious. I can’t resist buying a few whenever I am there. Sometimes I buy the entire case so that I get to enjoy them throughout the week. This is the first time I am making sorbet. Melons and cream don’t mix. For this sorbet, I decided to combine the cantaloupe and mango for a more concentrated flavor. Cantaloupe is delicious eaten on its own but when juiced or pureed, it can be pretty mild. Because both fruits are pretty sweet, I only added one third cup of sugar. Please feel free to add more sugar if you prefer. In a small saucepan, combine sugar and water. Bring to a boil over medium heat. Stir to dissolve sugar. Remove and allow it to cool. Cut cantaloupe in half. Scoop out the seeds. Then cut into wedges and remove the rind. Finally, cut wedges into chunks. Peel mango and cut into chunks. Puree cantaloupe and mango in a blender or processor until very smooth. Transfer to a large bowl. Mix in the syrup. Cover and refrigerate for at least 2 hours. Place frozen bowl on base of ice cream maker and turn it on. Pour chilled mixture into frozen bowl and churn until desired consistency, about 10 to 15 minutes. 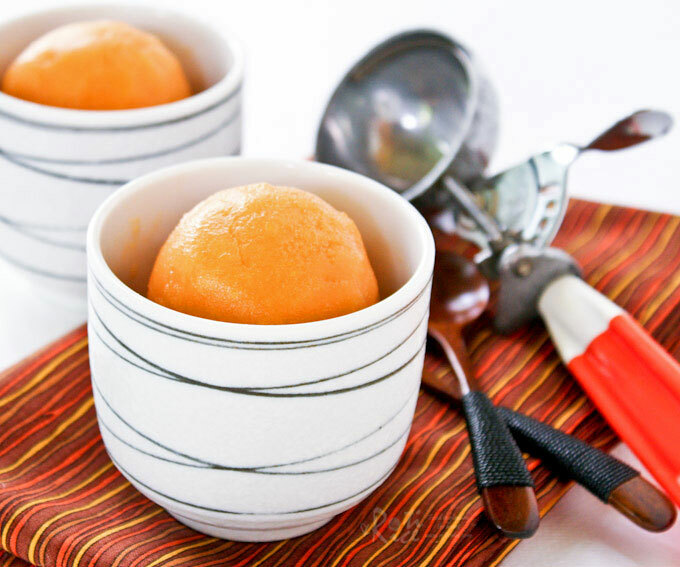 If you prefer a firmer consistency, transfer sorbet to a container and place in freezer for a couple of hours. 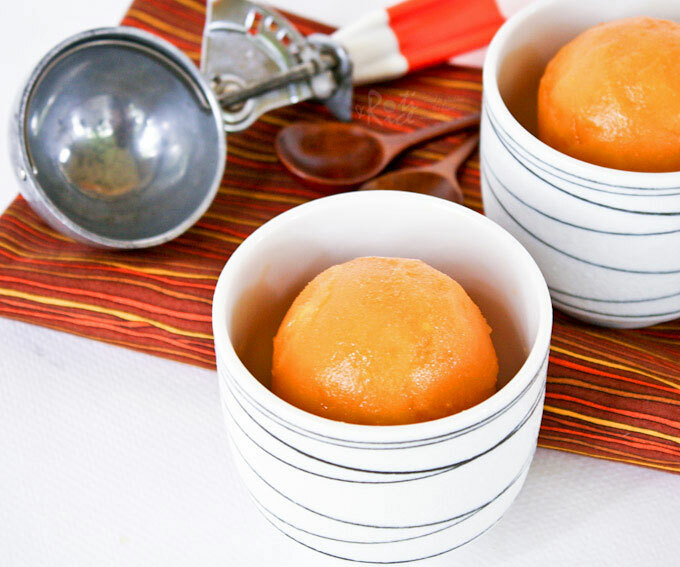 For a sweeter sorbet, increase sugar to a ½ cup to be dissolved in ½ cup water. Camtaloupe and mango sorbet sounds really good and great for this time of the year! You combined the two fruits my kids love. This one looks so easy to make. It’s perfect summer treat. 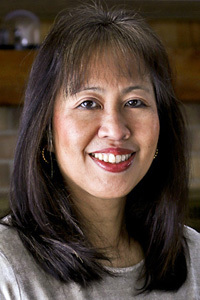 I hope all is well with you Biren and enjoy the summer with boys! Cantaloupe and Mango are my favourite fruits and now mango is in season. Definitely love to try this when I can get a ripe cantaloupe. I have never made sorbet either, though I do enjoy it in hot weather. You know I have mangoes in the fridge and that ice cream maker in the store room 😛 But, I think I’ll just drool over yours 😀 Lovely pictures, btw. Biren, I have used the same combination and love it! I love making sorbet! You’re right – there are SO many possibilities! I love the cantaloupe and mango combination! I’ve made just mango, but not cantaloupe. Sounds wonderful! I pulled my ice cream make out a couple of weeks ago and have already made 3 sorbets. 🙂 Of course mine is over 20 years old and the type where you have to put the blue ice in the freezer overnight and then self-crank. No big deal since I went from the HUGE manual ice cream makers where you use rock salt. 🙂 Putting this sorbet on my list to try! Have a great weekend. A colleague has been “persuading” me to get an ice-cream maker for a year already, and I’m still hesitant. Mmmmm…. after, looking at your sorbet, I’m drooling, Biren 😀 It’s not as difficult as I had envisaged…. Love melons, but I think I’d add some acidity to the sorbet, with a squeeze of some lemon or lime juice 😀 Thanks for the cool ideas, Biren! Oh how I love cantaloupe and mango! This is such a refreshing treat, Biren! So perfect for Texas summer! I haven’t made homemade sorbet in ages. And never a cantaloupe one (mango, yes). Great idea, and good recipe. You’ve inspired me! Good post – thanks. Ma ma mia… this is a killer! I’ll do anything for this. haha…. What a wonderful combination…very refreshing! I would have never thought of this combination! Sounds good to me!